You may never want to formally lead anything, but developing leadership skills will pave a path to a profitable career through authentic relationships. 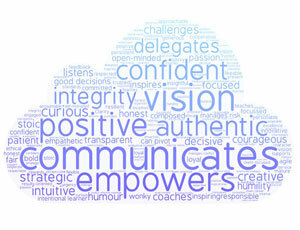 Do the above words in the word cloud feel comfortable to you? If not, invest in yourself and it will pay you back. Leadership sometimes feels like an elusive concept. You can think that you are leading, but are you really dictating? Leading is about creating a clearly articulated vision and having willing followers. That happens only when people believe in you and your vision and feel empowered and motivated to invest their time collaborating with others on your team to achieve it. There is a whole lot of authentic communication involved to make this happen. Think about your work environment. Do you grudgingly perform your daily work and gripe about your leaders? If yes, you are not sharing in the common dream. If you knew why you were asked to do something, understood what your part meant in achieving the endgame and were empowered and recognized, would you be a more willing follower? Probably. Embracing the concept of leadership is a foundational base to developing long-lasting and meaningful relationships — and relationships are foundational to developing business. It means being more strategic, more open and more communicative than you feel comfortable with. People have rarely complained about too much communication. If you have any doubts, book some time with yourself to think about your next five years at the very least. I coach and mentor frequently and one of my first questions is, “What is your five-year plan?” Rarely has anyone thought about it and yet it is one of the most essential exercises you could undertake for yourself. If you don’t have a vision for your own success, why would anyone follow you to nowhere? Lead yourself first. Your own assistant, paralegal and team are next. Now that you have a vision of success, you need to share, share, share, share and share it again. Collaborating with others to fine-tune the vision is essential for people to “buy in” to the dream, commit to it and help you make it happen. They need to know what is in it for them and to feel empowered and recognized when following you. You have the power to create a dream team and move your vision forward faster than others. Look around you — few people really get what it is to lead and be proud of people who outshine you. How many times have other lawyers commended you or even thanked you? A true leader is confident and humbled by the contribution of others. A true leader praises others in public. A successful leader is magnetic and attracts colleagues and clients. Clients feel that you are going to lead their legal issues in an authentic, transparent and mutually beneficial manner. Practising leadership on yourself and your team will set you on the path to further success and marketability.